We all have some funny coincidences in our lives. Personally, I happen to have a lot of birthday coincidences: my husband and dear friend Katrina share the same birthday… three of my bridesmaids were all born in February… my younger daughter was born just one day after my mom’s birthday… and so on. Perhaps the oddest coincidence of all is that in August my dad’s birthday falls just one day before… my mom’s boyfriend’s birthday. Ahem. Now, I don’t know much about astrology, but it seems to me that there is something going on there. So this year the girls and I traveled to celebrate both of these birthdays, and fortunately for us my mom and dad don’t live too far apart for that to be possible. But if you’re like me you’ve already realized the unique conundrum this posed for us this year: birthday cake. I mean, these are two people I love in very different ways. They are apples and oranges. I’m grateful at least that their birthdays had the decency to fall one day apart so I always have the opportunity to celebrate everyone- but this cake thing presented a new, unprecedented problem. For the first time in our entire Year of No Sugar I had a choice to make: whose birthday got celebrated with sugar, and… whose did not. Ack! Ultimately, I used my understanding of the two birthday honorees to figure it out. My dad is pretty adventurous when it comes to food, and always willing to question tradition in the interest of trying something new. I know he is interested in our family’s No Sugar project- we’ve had a series of conversations on the subject of what-the-heck-we’re-up-to. On the other hand, John, who has been with my mom for the last twenty-five years or so, is more of a person who knows what he likes and likes what he likes. For his birthday dinner, for example, we were going to the Italian restaurant that has been his favorite for the last few decades. He also has a very live-and-let-live philosophy- he is entirely neutral on the subject of our No-Sugar adventure. Then there’s my mom. Like Dad, Mom is supportive of our family project in spite of the fact that I’m pretty sure she’s worried I fell on my head before coming up with the idea. Mom’s the one who reads all my posts practically before I can even press “publish.” Yet, she’s also the one from whom I got my love of celebrations, and my implicit understanding that there are just certain things you do to celebrate a birthday. You have a special meal. You have decorations and presents and sing the birthday song. And you have a fabulous cake. So it was decided that Mom would order a fabulous cake with a New Orleans theme, and that would be our *official* August dessert. Meanwhile, I was planning to make dinner for Dad at his house, so I would make him his longstanding favorite for dessert: poppy seed cake. God help me if it turned out awful. I know Dad wouldn’t mind, but I’d feel terrible. But you know what? It didn’t turn out awful. Dad loved it. Everybody loved it. I was astounded. No one even asked if there was sugar in it! Afterward I told everyone that there was, technically speaking, no fructose/sugar in the cake at all. It was Dad’s turn to be astounded. My seventeen year old brother’s reaction was along the lines of “uh, yeah, whatever.” He didn’t care. Does it taste like cake? Must be cake. What I cared about was that he had eaten the whole piece- everyone had. Now, truthfully, the cake wasn’t quite as “floofy” (that’s a technical term) as usual, but I think playing with the amount of dextrose might fix that. And while we’re being picky, the cream cheese frosting seemed, if anything, a bit too sweet to me- another thing which could be tweaked. All in all, I counted it a success. And of course, the next night we had cake- again! Except this time it was the real-sucrose-deal. We picked up the gorgeous confection from the Riviera Bakery where they are famous for fun things like Dr. Seuss-inspired shapes, edible candles, and cakes that look like giant hamburgers. 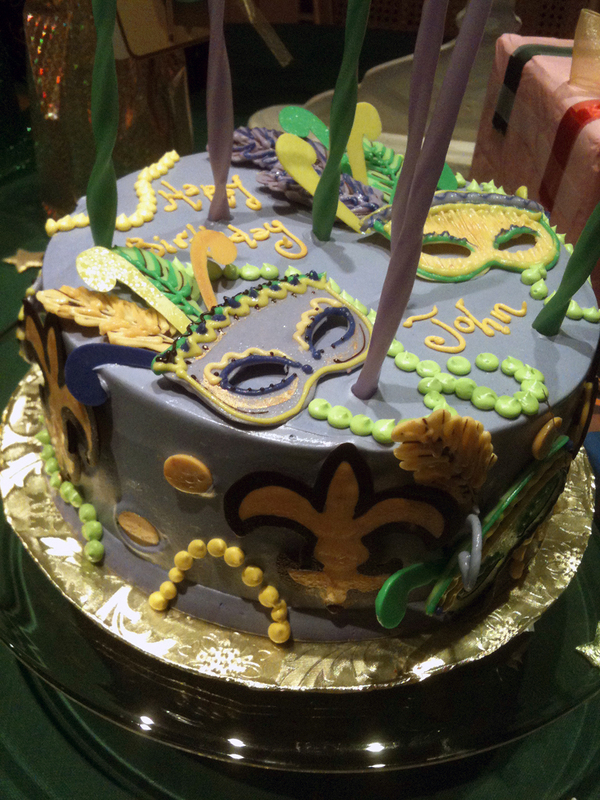 John’s New Orleans cake was a vision in purple, green and gold, complete with white-chocolate Mardi Gras masks, and Fleur de Lis. Inside, three thin chocolate layers were interspersed with “cookies & cream” filling. It was literally a work of edible art. Perhaps predictably, it seemed overwhelmingly sweet to me. I was surprised to find that I couldn’t finish my slice, and then noticed that neither could the girls. It was very good, but good in the way candy is good- you only need a few bites and it’s enough. So in the end we were able to participate fully in both birthdays… apples and oranges. And we certainly got our fair share of cake. Thank goodness. Eve, you are a wonderful writer! I am thoroghly enjoying your posts and really hope you get a book deal. I stumbled across your blog while researching giving up sugar. Hope I can embark on my own journey soon. Health and emotion-wise, are you feeling more stable, more in-control since giving up the evil white? Of course!! I’ll add it to my recipe section within the next 24 hours- hope you like it!! 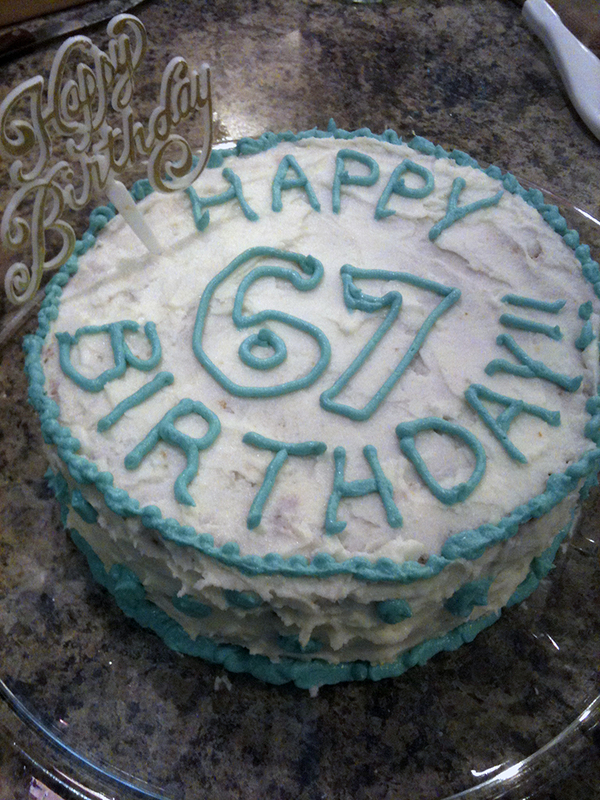 Kendra- Hope you found the Poppy Seed Cake recipe I posted under the No Sugar Recipes section- let me know how it went! That being said, I have been having good luck with simply substituting dextrose for the sugar in any given recipe, sometimes adding a bit more: if it calls for a cup of sugar, I use a cup and a third or half of dextrose. I hope your son loved his cake. That’s the thing- kids like sweet, they don’t care if it comes from dextrose rather than sugar! You are currently reading A Year Of No Sugar: Post 67 at Eve O. Schaub.